The fast-track way to track the foods you've stored to help save time and money. 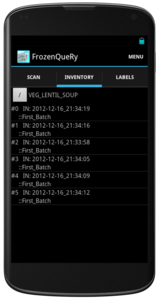 The JoeLABs FrozenQueRy app and custom generated labels enables the conscientious meal planner to effectively enumerate edibles from food ingredients to fully prepared and portioned meals with concise, serialized encoded labels scanned into their smartphone/mobile-device for timestamped inventorying, facilitating a quickly accessible running list of clearly marked items in food storage. Are you a batch cook who prepares meals ahead of time? Do you often wonder whether you have dinner available at home while leaving work? Do you know how many burritos you have left? How long has that lasagna been in the freezer? What exactly is that iced-over blob? 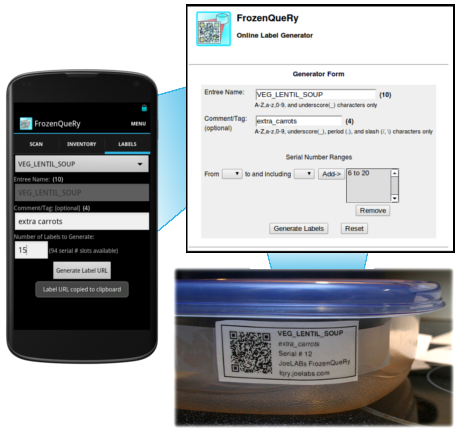 See how the FrozenQueRy advantage can optimize your kitchen workflow! 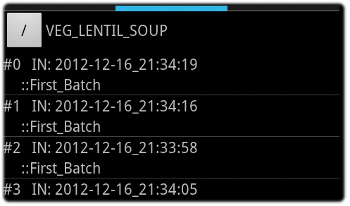 Create clear and concise serialized labels for your items/entrees on the FrozenQueRy web-based label generator, through our web form or the in-app label assistant, for printing to affix on your food containers. 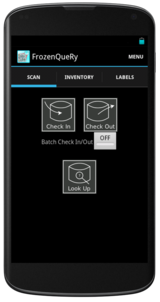 Check-In Scan your items into the FrozenQueRy inventory by scanning the QR-code portion of the labels through the FrozenQueRy app. 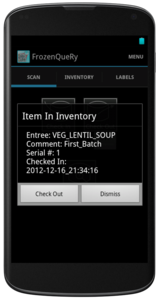 The app records the item/entree name and the Comment/Tag of the label, as well as the date and time of Check-In. 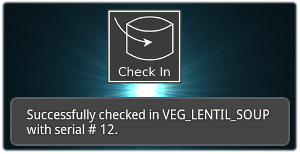 Store your scanned and checked-in food containers as appropriate. Browse the FrozenQueRy Inventory listing to quickly find out how many of a particular item is presently stowed away. 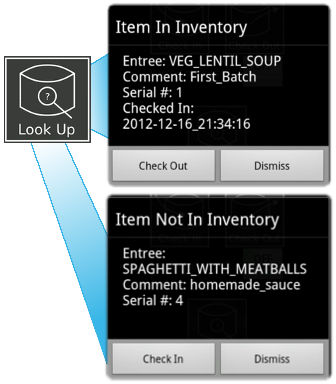 Drill down the Inventory listing OR Look-Up Scan the label to recall when a particular item was stored. Check-Out Scan the label to remove an item from	listing when removed from storage for use. The item may also be checked-out directly from the item inventory listing. Single and Batch-Mode Scanning for quick Check-In and Check-Out. Look-Up Scan to determine inventory status of the item in question, and the date/time it was checked-in if in inventory listing. Concise menu-level inventory listing shows all inventory contents by name and total number of items of each entree. 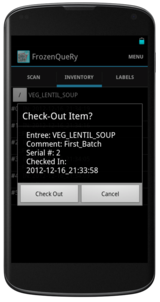 Detailed entree-item inventory listing displays all checked-in serialized entrees, when each item was checked-in, and any comment/tag associated for that item. 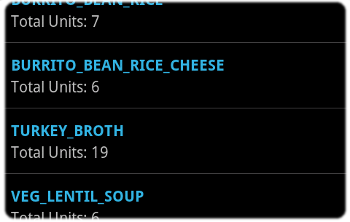 Stores up to 100 serialized items per entree name, sorted under up to 50 unique entree names. If you're needing more inventory capacity than this, please contact JoeLABs to see if we can deliver you a custom application solution for your enterprise. 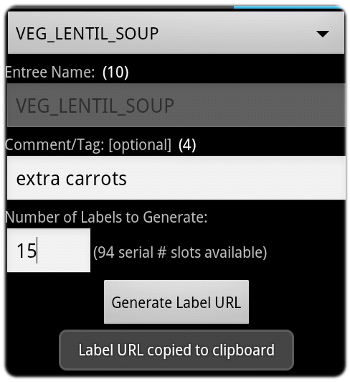 In-App Label Generator Assistant to assemble a direct URL to our web-based FrozenQueRy Label Generator Utility to automatically create labels with formulated serial number ranges that hop over serial numbers already in use in inventory. The URL is conveniently copied into your phone's clipboard for you to paste into email or text file for retrieval on your printer connected computer. Exports running inventory listing to XML file on external storage for safe keeping and transfer. 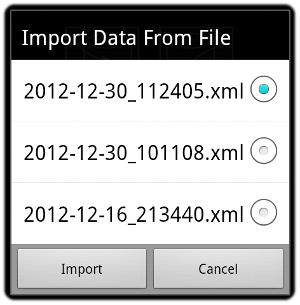 Imports inventory listing from XML file for data recovery. App uses No Ads, No Tracking, No Personally Identifiable Information. Same features as the standard version with exception of a 10 items total in inventory limitation. Try out the FrozenQueRy with up to 10 checked-in inventory records. As with the Ice-Cold Standard Version, Lite Version of App uses No Ads, No Tracking, No Personally Identifiable Information. Android™ 2.2+ devices equipped with camera. 3.2 Megapixel or higher camera resolution recommended. Zxing Barcode Scanner installed. FrozenQueRy performs barcode scan action using the ScanningViaIntent library. 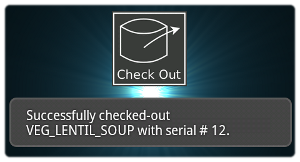 If Barcode Scanner is not installed upon a Check-In/Check-Out/Look-Up Scan action, a prompt will appear to request installation. Available space on Write/Read access mounted external storage to use Inventory Data Backup/Retrieval functions. Updated version of HTML4 and CSS3 compliant internet browser software (Chrome, Firefox, or Opera strongly recommended) with internet access to http://joelabs.com. Printer equipped with plain paper. A laser printer for printing labels is recommended for better printed-text moisture resistance and clarity. Actual app screens during operation may vary from sample screenshots presented. © 2005 - 2019 JoeLABs. All Rights Reserved.